The Scotty Cameron Newport 2.5 looks like a standard Newport style head with all the hallmarks of a Cameron design. It's an Anser style head which combines softness with modern lines. The major difference between the Newport 2.5 and the standard Newport 2 models is the way the shaft attaches into the head. 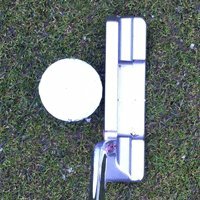 Rather than having the "plumber's neck" which is standard for most Anser putters, this putter has less offset and a very shallow double bend hosel. The effect this has on appearance is that you get a far greater sense of the shaft aligning with the face of the putter. I felt this gave me the feeling that I was striking the ball my hands more directly, and it's a feeling that you'll probably like. You also don't lose too much sight of the heel of the leading edge of the putter because the hosel attachment is super low profile and does not obscure your view of the heel end of the leading as much as the regular plumber's neck which you'll find on the Scotty Cameron Newport 2. The downside of the style of hosel used in the Scotty Cameron Newport 2.5 is that it makes the putter extremely toe heavy. This is fine if you like to feel the putter head swinging on an arc. It is a pretty extreme feeling however and in fact feels quite close to the toe weight of a blade putter. You'll find the toe really wanting to swing past the heel through the ball, so be ready for this if you purchase this putter. It'd suit you if you swing the putter on quite a pronounced arc. As the face will want to rotate aggressively, it'll be just about the worst putter you could buy if you use more of a straight-back-straight-through stroke with a square face. As long as you're happy with this, the Scotty Cameron Newport 2.5 has a lot to offer. Contact with the ball gave a good feeling sensation and you'll probably grow to love this putter. Unfortunately this wasn't my attribute of the Newport 2.5. Although the roll was by no means bad, somehow this model wasn't the equal of the highly similar Scotty Cameron Newport 2 Studio Select or the Scotty Cameron Newport 2.5 Center Shaft. The difference is that the roll seemed to be hooking just a tiny bit with right to left spin. There's no doubt that this is an elegant putter which will appeal to your eye. The small amount of offset gives you a very clear view of the leading edge when lining up. Unfortunately for my money, the Scotty Cameron Newport 2.5 was let down by the feel and the roll, both of which were hooky and felt somehow less solid than a regular Scotty Cameron.